We will be starting an attendance incentive when we get back from Thanksgiving until Christmas Break. We want to encourage our students to stay focused and get the most out of the four weeks in between breaks. Texas Education Agency (TEA) Section 25.092 contains the provision of law commonly referred to as "the 90 percent rule," which applies to a student in any grade level from kindergarten through grade 12. Students who do not attend 90% of the school days may be denied credit. Cumberland Academy has 174 instructional days for the 2018-2019 school year. Thus, a student who misses more than 17 days will have missed more than 10% of our instructional days and may be denied credit. Please help us in making sure your student receives an adequate education and get them to school everyday, on time, and stay all day. 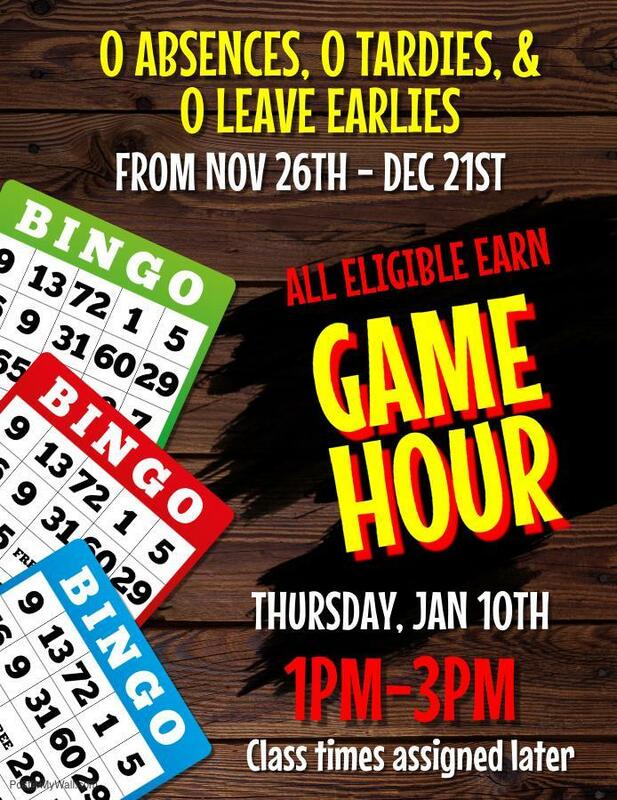 We would like to reward those students who spend the four weeks in between breaks at school all day, every day with a Knights Game Hour! See the flyer attached for more details. Thank you for your support.